During the Revolutionary War, the British knew who the American intelligence operatives were and captured them. Good intelligence is key to winning a war. George Washington, with the help of Benjamin Tallmadge, formed a super secret organization called the Culper Spy Ring (History Channel, Brad Meltzer’s Decoded, WikiPedia) on Long Island (how cool…I am from Bay Shore). The original Culper Spy Ring was crucial to America winning the war. Some think the Culper Ring exists to this day. A small group of people (each individually selecting their successor) “Serving the Presidency” (not the President….the Presidency). Beecher is an archivist at the National Archives. He is helping an old friend (and his first true love), Clementine Kaye, find information about her father. Walking thru the archives, Beecher (with help from his friend, Security Guard Orlando), shows Clementine the super secret room (SCIF-Sensitive Compartmented Information Facility) used by President Wallace to read. While in the room, coffee spills, and a document comes to light. A secret document. From this auspicious start, “The Inner Circle” races through a maze of lies, deceit, and deception as Beecher and Clementine try to unravel the mystery behind the secret document, and how it relates to the President. “The Inner Circle” is a fascinating lesson in history, spies, the Culper Ring, and the Plumbers. 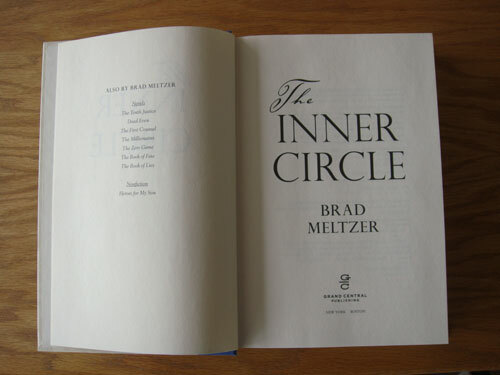 “The Inner Circle” is truly a great book, loaded with twists and turns that will keep your head spinning until the very end, and then some (yes…I see a sequel). Meltzer is awesome. In fact, read “The First Counsel” for a 5 WaterTower thriller about the First Family.